Diners can now prepare to eat their hearts out at some of Los Angeles’ most coveted dining destinations, as reservations are now being accepted for dineLA’s Restaurant Week. The widely-popular, twice-yearly program returns January 20-31, 2014 featuring delicious newcomers Herringbone LA, Mud Hen Tavern, and Allumette alongside returning favorites such as Crossroads, FIG Restaurant Santa Monica, and Petrossian Paris Restaurant & Boutique. To book a reservation, simply visit dineLA's website and choose from over 300 restaurants offering a selection of specially-priced $15, $20 and $25 lunch menus and $25, $35 and $45 dinner menus. 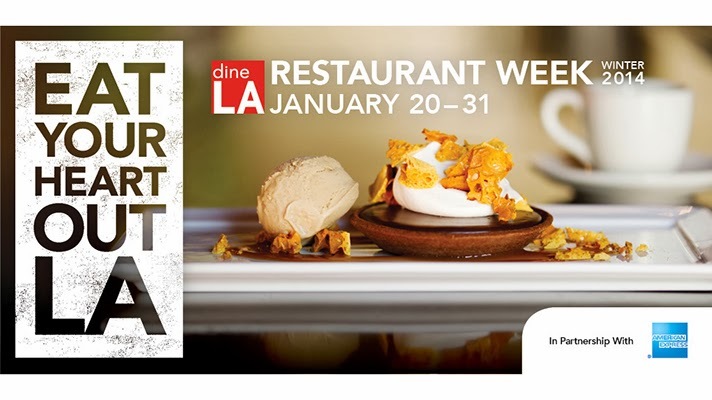 For the first time in its six year history, the Los Angeles Tourism & Convention Board has added $85 experiential tasting menus to dineLA's Restaurant Week, as part of a new pilot program. Designed for those looking to elevate their dining experience, the multi-course tastings are available at some of the city’s most sought-after restaurants. The full list of restaurants participating in the $85 tasting menu program will be released in early January 2014.
dineLA, the official authority on all things culinary in Los Angeles, presents Restaurant Week to invite both Angelenos and travelers to experience the variety of globally-influenced culinary offerings throughout the greater LA area. From Venice to Hollywood, Downtown L.A. to Beverly Hills, both casual diners and foodies are invited to enjoy meals at a great value from acclaimed chefs including Sang Yoon, Ricardo Zarate, Susan Feniger and Jimmy Shaw. For a chance to savor Los Angeles’ cuisine all year long, diners can enter to win “dineLA for a Year.” Food lovers who sign up for the dineLA newsletter are automatically entered to win the ultimate prize—a restaurant gift certificate every week for one year. The 52-week prize-pack is valued at an appetizing $2,600. dineLA’s Restaurant Week is a 12 consecutive-day, non-ticketed dining event, showcasing Los Angeles as a premier dining destination and highlighting the diversity of culinary experiences LA has to offer. Presented by the Los Angeles Tourism & Convention Board and in partnership with American Express®, dineLA’s Restaurant Week is designed to stimulate business and introduce new customers to restaurants located in the many neighborhoods throughout LA County. For more information, visit their website or visit them on Facebook.